If you love to pop something into the slow cooker for Sunday Dinner or during the week for an easy meal, but want to change it up a bit, then a brisket is a great way to go. It’s a perfect cut of meat to start first thing in the morning since one of the tricks to a great brisket is to cook it slow and low- really it’s an all day affair. 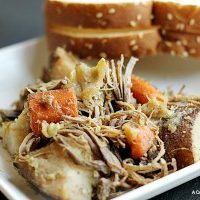 Crockpot beef brisket is often made with barbecue sauce. 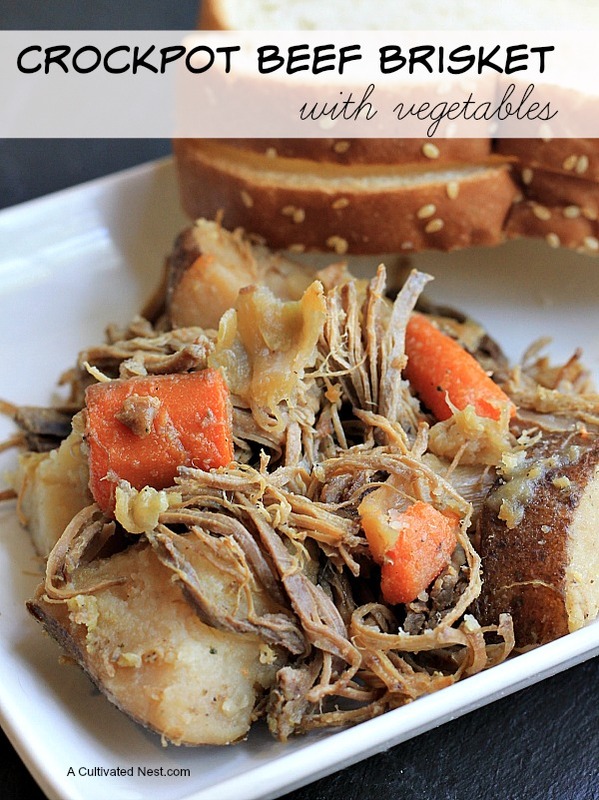 But I’ve found that it’s delicious as a shredded roast paired with yummy root vegetables. 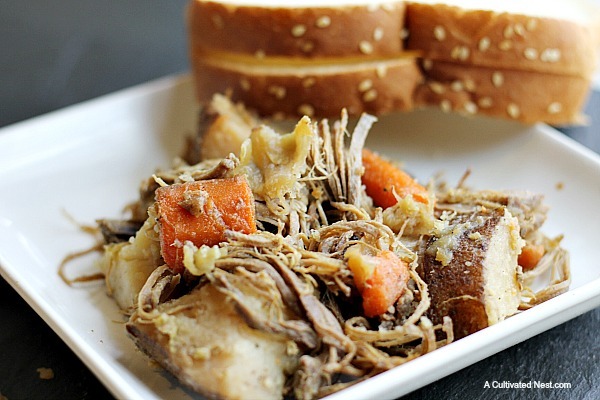 This delicious meat just falls apart in the slowcooker! 1.Peel and chop carrots into large pieces, rough chop cabbage, onions, and potatoes- set aside while you prepare the rest of the dish. 2. Drizzle olive oil in bottom of slow cooker and rub it around to coat bottom and up the sides. 3. Place brisket in bottom of cooker, fattier side up (the fat keeps the meat from drying out and can be removed after cooking). 4. In a separate bowl whisk together Worcestershire, black pepper, ground mustard, and garlic salt- pour over top of brisket. 5. Arrange vegetables around brisket. 6. Cook on low for 8-10 hours (you can cook on high for about 6 hours but the texture is much better when cooked low). 7. If you are home while brisket is cooking -several times throughout the day spoon the liquid in the cooker over the meat, it will still be delicious even if you aren’t able. 8. Shred the brisket by pulling it apart with two forks. This is old-fashioned comfort food for a cold day! Peel, and chop carrots into large pieces, rough chop cabbage, onions, and potatoes- set aside while you prepare the rest of the dish. Drizzle olive oil in bottom of slow cooker and rub it around to coat bottom and up the sides. Place brisket in bottom of cooker, fattier side up (the fat keeps the meat from drying out and can be removed after cooking). In a separate bowl whisk together Worcestershire, black pepper, ground mustard, and garlic salt- pour over top of brisket. Cook on low for 8-10 hours (you can cook on high for about 6 hours but the texture is much better when cooked low). If you are home while brisket is cooking -several times throughout the day spoon the liquid in the cooker over the meat, it will still be delicious even if you aren’t able. Shred the brisket by pulling it apart with two forks. YUM! I truly love using my crock pot! Have a blessed day and thanks for the recipe! HUGS! I haven’t done a pot roast this winter. Thank you, I’ll be trying this recipe. This looks delicious – thanks! We don’t own a crockpot, but I have to say that your recipe looks delicious – maybe we should get one. 2 cups of beef broth listed with Ingredients seems to be missing from the Instructions. Recipe sounds easy and delicious!